Single issue Ramble today. 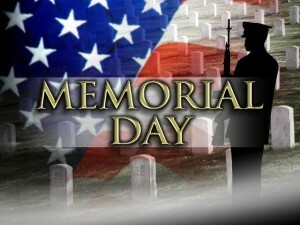 I want to speak briefly about Memorial day which is today. It’s always been a special day for me, because honoring our vets has always held special meaning for me; it’s a lesson my parents instilled very well, indeed. It was brought home to me, as I was recently looking at pictures from a trip we made through the Gettysburg PA area some years ago. It’s a particularly meaningful thing, when you’re standing on that field…. Something that goes well beyond the cold facts and figures about who died from what company, how old they were, or even where they were from. It’s more a feeling you get…. You can sense it… not unlike being at Ground Zero in lower Manhattan, or visiting Arlington National Cemetery. I’m told Omaha Beach, and Pearl Harbor and many other sites are the same way. I’ve been at the funerals of firemen and policemen who died in their line of duty, and that was also remarkably similar. In each case, we’re dealing with places and concepts of death. But death alone doesn’t do it; doesn’t create that solemn atmosphere that is so unique to the above places. After all; there are lots of mass casualty accidents have happened over the centuries and their sites are well marked, and revered, or at least held apart, and yet, their impact doesn’t approach that of an Iwo Jima or a Pearl. Even under the shelter of the relative safety of the time that has passed since the events, as you stand in each place, you can still feel it; Lives were lost there that were willingly (And in the case of the civilian deaths at the towers, unwillingly) sacrificed toward a higher ideal. Our feelings and conclusions can be far different from what those lost experienced. Yet, their lives and their sacrifices still count for something. And the thing is, it doesn’t take much for us to out ourselves in their mindset. Think of it this way; Every single man who died at Gettysburg, at Normandy, at Pearl and all the rest, has meaning for us because each of them, had their own lives, just as we have our own lives. These people loved, they laughed, they cried. They had a favorite food, a favorite color, a particular bit of music, or of poetry stirred their souls, like none other, just like we, ourselves. Every bit as much as you and I love our lives, they loved theirs. Their lives were as precious to them, as yours is to you. Their loss was as keenly felt by their loved ones as yours would yours. And yet, they gave their lives up, for something bigger. I have a neighbor, whose father just recently needed a liver transplant. This neighbor willingly gave up part of his liver to be transplanted into his father. A noble action, certainly, commendable, and impressive. But with all respect to my neighbor, the choice to do that is comparatively easy to make. He knows and loves his father, and the sacrifice is fairly light by comparison. How much more noble is a sacrifice of one’s life for people that one will never meet? Well, the people we honor today, those in uniform particularly, but some who were not, gave of themselves for the benefit of people they would never know…. you and I, and countless others from many nations. If not for their sacrifices, you’d not be reading this BIT, because I’d not have written it…. we’d be living in a very different world, possibly, one not nearly as good to us as it has been. Look upon those actions, those sacrifices, and know what you’re seeing is strength, courage, and nobility in measures that should not… can not, be ignored. It must be honored by us all; it was made, after all for our benefit. Think about that as we deal with the solemn proceedings for their day.